Is a Hoverboard Real & Can You Really Find a Hoverboard for Sale? The video below (mid-page) makes you wonder, “Is the Hoverboard real”? Well I’m sorry and a bit disheartened to say, “It is not” (shame on you Tony Hawk). 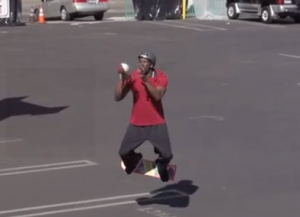 You won’t find a real hoverboard for sale anytime soon. Remember that famous Back to the Future hoverboard video and how you thought to yourself, “One day this will be the reality”? Well, that reality will have to wait a while. I had a genuine feeling of despair when I saw the reports it was a total hoax. Sure, I saw the ultra thin board. And yes, the logical part of me tried to rationalize: that board is too thin; there’s no way to have that much power in such a small package; & it’s too efortless. Hell, even real hovercrafts don’t levitate that high. After all, I found this on FaceBook on a good friend’s wall, so it had to be real right? They even had a website built for the hoax: huvrtech.com. So what did I do, naturally? Yup, prior to acknowledging the farce that it was, I went out and bought huvertech.com within minutes of seeing the video. I was thinking, “Wow…they had forgotten to get all the obvious near misspellings of the domain name!” I mean, something like this was sure to go totally viral. It looked like the next big thing and I wanted to ride that wave. I thought, this could be my very own “amason.com” mispelling, so I took the plunge. And then, sadly, the comments started coming in and I had to face the fact that my imagination (and possibly a little greed) had gotten the best of me; there is just no real hoverboard for sale yet & it doesn’t exist. I believe, however, in my lifetime, there will be something like this come to fruition; and I’ll be the first to jump on the bandwagon and try to break my neck with it. So now what? It looks like I now own the domain name, huvertech.com (at least for the next year); therefore, I thought I’d make use of it and write this post. It is a viral concept. But how could I, ethically, redirect any stray traffic the domain might get to my website without coming across as spammy? So I thought for a bit and figured it out….I’d write a post about it and somehow connect it to internet marketing. Then I started thinking…..the kind of people who would dream of things like a hoverboard, might also have the necessary vision needed to see the profit potential in making money online from home. They’re computer people right? And my business definitely revolves around computers & gadgetry to an extent. So I wrote this post, redirected my new domain to it, and here we are; and I’m pretty sure I managed to keep Google happy in the process. Let me tell you this: if you have the vision, enough, to just wonder–is the hoverboard real?–then you already have a huge head-start on the competition. Many adults have lost the creative ability to be effective internet marketers. They’ve lost that visionary asset to see things through a child’s eye. Well guess what? Just the fact that you would wander about the possibility a hover board could exist, let’s me know you are in the right place at the right time. If you would like to earn extra income online, take take a look, and your imagination may just end up being your biggest asset. Thanks for reading my Blog! After watching this video, you’ll understand why so many people were asking, “Is the hoverboard real”? It looks like there is finally a real hoverboard created by ARCA Space Corporation. They are taking preorders now for the sum of $20K to $25k (with options). Ship Dates are expected (starting April 15, 2016). It will go about 12 mph and keep you up in the air an estimated 3 to 6 minutes contingent upon selection of the thrust version vs the endurance version of the board. Can be steered with the board itself (via body weight distribution) or the available smartphone app. good catch. I don’t freak out over typos too much though. If you wait for every detail to be perfect, you’ll never get anything posted. To request information product. I am speek english, speek portuguese. I am not sppek english, speek portuguese. Hi Luiz, could you skype me @ “ourneucopia” and I can get some information to you in portuguese? I watched the video of you on youtube and enjoyed your product. I’m in Brazil more precisely in the city of Curitiba and would like to know the possibility of working with your product here. Already have an import company. Orlando de O. G. Filho. If real, the board should be using a powerful jet engine, but this power is to be limited based on the physical size of the board, in other words there will be a restriction regarding the weight of the person who is using the board. You can send your comment or technical explanation on my e-mail :mahmoudemera@yahoo.com as well as facebook. IT’S REALY GR8 TO BE IN CONTACT WITH YOU,,, I WONDER IF THERE IS ANY POSSIBILITY TO DISTREPUTE THIS PRODUCT IN MY COUNTRY???? I’m afraid not, the technology isn’t there yet. Thanks for the comment. I did see you joined my mailing list though. If you are looking for another income source, I encourage you to download the Ultimate Profit Model which I sent you a link for in the first email. Hello,my name is jack fajgenbaum im from Panama city, Panama when i saw this video i was impressed. i would really want to know if i could distribute them across Latin America. Please contact me thank you. Hi Kevin, Are you referring (yes I dared to ask) to the hover board or my cornerstone product to help you make money online? The last video explains that the hover board is not yet a reality; however, if you would like to learn to make a lot of money online, take a look at my eBook.